When you choose a digital marketing agency to work with, you need to look for the best one for your business. The problem is that many business owners do not know what they should be looking for. Fortunately, there are a number of factors which make a digital marketing agency and you need to know what they are. As with all businesses, communication is key when dealing with a digital marketing agency. Before you agree to work with the agency, you need to evaluate their communication. The first step is noting how long it takes them to get back to you when you initiate contact. If you have sent a request to them via their website or via email, note how long it takes them to get back to you. If you called the agency, you should take note of how long it took them to answer the phone and to get through to someone that can help you. It is not only the speed of the communication that you need to evaluate. You also need to consider how professional the communication is. The communication you have with the agency should be easy to understand, but should not be unprofessional. Another factor that makes a digital marketing agency great is their creativity. You need to work with an agency that is able to think outside the box and provide you with marketing that will beat your competition. There is no point in working with an agency that offers you the exact same advertising that your competitors are using. To determine the creativity of the agency, you should ask them about what marketing campaigns they would provide you with. Of course, it is important to note that no digital marketing agency will provide a complete rundown of the campaign they will provide. 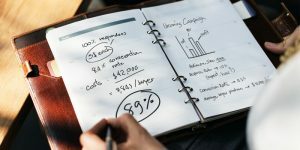 However, they should be able to give you some idea regarding the campaign and you will be able to determine if this is different from your competitors or not. There are a lot of business owners who do not realise how important data is to marketing. Without the right data, a marketing agency will not be able to correctly determine your target audience or determine how best to engage with them. Data will also help the agency determine what your competitors are doing and how you can stand out from the crowd. The primary issue that you may find with this factor is that it can be hard to determine if the agency has a mastery of data. The best way that you can do this is to look at what the agency has done for other businesses. If they have achieved the right results for other businesses, this can be used as an indication of their mastery of data. Of course, you should look at their results for businesses in different industries because this will show that the agency can find and use the data that they need to. If your business needs transport equipment, you have two real options available to you. You can rent the equipment that you need from a company such as http://www.rentco.com.au/portfolio/trucks/, or you can purchase it. Buying and renting both offer advantages and disadvantages. You’ll want to compare the perks to the drawbacks before making a decision. If your finances are tight, renting is probably the best option for your business. While there are affordable purchase options — like buying used — rentals usually require you to spend more up front. It’s important to remember that you won’t just have to cover the initial cost of the equipment that you buy. You’ll also have to pay a number of fees. For example, you’ll need to have insurance for your equipment, and you may have to pay licensing fees as well. That stated, if you’re going to be using this equipment consistently, you may spend more renting in the long run. Crunch the numbers and determine the option that makes the most sense for you financially. When you purchase transport equipment, that equipment will always be available to you. If you own your own equipment, you’ll be able to use it at any time, day or night. If a job falls into your lap at the last minute, you won’t have to worry about renting the necessary equipment; you’ll already have what you need. Of course, 24/7 access isn’t necessarily something that every business needs. If you don’t need to use transport equipment very often, having this equipment ready and available to use might not benefit you in any significant way. When you own equipment like this, you’ll have to be prepared to store and maintain it. The convenience of owning your own equipment may not be worth the extra hassle. Consider your situation; think about what is best for your business. When you rent your equipment, you won’t be limited to using the same kinds of equipment over and over again. Instead, you’ll be able to select the equipment that is best for the job at hand. If desired, you can rent a different piece of transport equipment every time. If your business works with a wide array of clients or handles many different kinds of materials, you may appreciate being able to select transport equipment that’s well suited to the task at hand. If you tend to take on the same kinds of jobs over and over again, you might not need to change the equipment that you rent. A single piece of transport equipment could cover all of your needs. Compare the costs of buying versus renting. Look at some of your other options, like buying used equipment. Find the option that makes financial sense for you and your business. 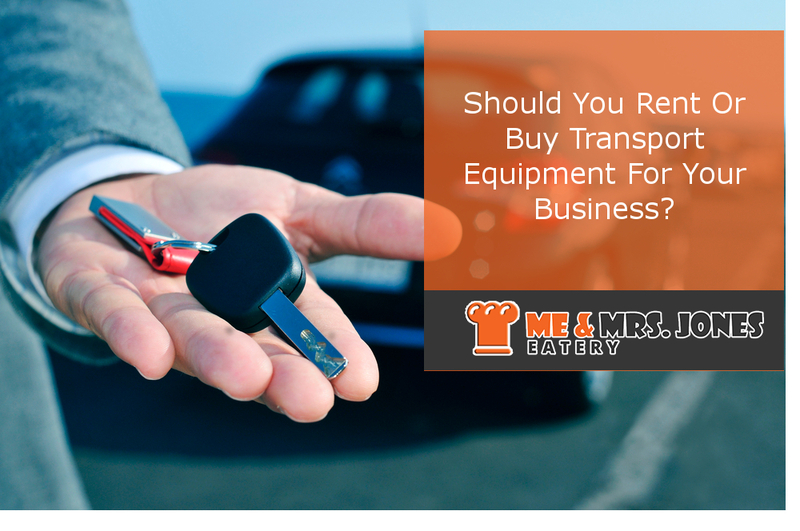 Whether you rent transport equipment for your business or buy it outright, you should be completely satisfied with your decision. How strong is your network security? If you’re a small business owner, the answer to that question is probably “not strong enough.” Small businesses are frequently the target of hackers. Thankfully, there are plenty of things you can do if you want to improve the security of your network. Implement these suggestions, and your security will improve. In a lot of cases, major security breaches occur because of a single weak password. You can’t allow your employees to use easily crackable passwords like “password” or “1234.” Passwords like this compromise the integrity of your entire network. It’s smart to have clear, easy-to-follow rules regarding passwords. For example, you may want to request that passwords contain at least one letter, one number, and one character. Passwords with this level of complexity are significantly more difficult to crack. You will also want to make sure that your employees are updating their passwords on a regular basis. If you’re providing your employees with access to hardware, you need to be careful about what they are allowed to install on that hardware. You shouldn’t allow any sort of installations unless you have approved them directly. A single bad installation could compromise your entire network. If you want to maintain control of your network, you need to make sure that no one is installing software that you haven’t approved of. Set up a security system that can prevent downloads. As the old saying goes, a small amount of prevention is better than any cure. What sort of firewall are you using? Your firewall is going to make or break your security system. Spend a lot of time researching your options for firewalls. Make sure that your firewall is every bit as strong as you need it to be. If you use a fantastic firewall, you’ll be able to avoid a lot of common problems. Firewalls make it much more difficult for hackers to access your system in any way. The right system will also keep you from being negatively impacted by malware. Make sure that your firewall provides all of the protection that you need. You should never put off an important update. If you keep a watchful eye on updates, it will be much easier for you to keep your system in good working order. In many cases, updates occur because security issues are being addressed. If you fail to install these updates, you will be a prime target for would-be hackers. The sooner you update your system, the less likely it is that you will have to deal with any sort of attacks. There are many excellent network security solutions available in the market. Do some research into implementing one in your workplace. These all-in-one services provide the most comprehensive protection. Small businesses have to worry about network security like any other businesses. If you are the owner of a small business, you should start thinking about how your security system could be improved. If you follow the advice above, you should be able to improve your network security significantly. Your system will be more efficient and effective than ever. In every business there will be times when everything is not going according to plan. A million things can influence the running of a business. The economy, newer establishments, change in the area where your business is situated, change in clientele, these are all factors in keeping your business afloat. Most of these you cannot do anything about. It is not in your power to change these things, but you can work with them, or around them, and even straight through them. There is always something else you can try. Remember that your business is driven by customer need. You built a stable client base and should use this as a point to grow from. Keep strong relations with your clients. Good results and Excellent Customer service attract business and is always a good way to get free advertising. Word of mouth goes a long way to selling your business and its reputation. Don’t stop growing, always keep on moving forward, even if it is one tiny step at a time, eventually you will get there. Remember your long term thinking and planning, the vision you had for your business. Think out of the box and see the opportunities that no one else wants to take. Take a chance that nobody else wants. Empower your personnel to make their own decisions and to take pride in their work. Everybody should have a voice. Good ideas come from anywhere. Always plan for the best, but expect and prepare for the worst. That way you will have a backup plan at the ready. Always stay positive, even at the worst of times. Perseverance is essential for survival. You started your business in good faith. You did the research and delivered your product or service. It was always going to be hard work. Just keep on going. Keep thinking out of the box. Keep knocking on unopened doors, and inspect all the possible avenues you could still explore. In the end, you are still the decision maker that decides if there is a way forward. You will know when to call it a day. But that should be the very, very last avenue you should take. Working in the food industry, you need to do your planning for each day to the tiniest detail or get swamped. A scheduled routine should be established for the operation to run effectively. There should be enough time for preparation that needs to be done before opening time. You need personnel that love food and your business as much as you do. Owning, and running a food shop, eatery or restaurant, you need to stay on top of new inventions that will make your day-to-day life easier. 1. 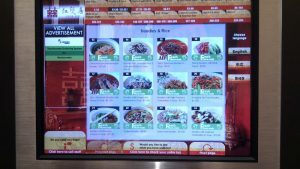 Touch screen Food Vendors: Could be used in all kinds of food establishments. Be prepared to pay for this convenience, but in the end it will be worth every cent. People like new technologies and would love to create their own orders. Your business might even benefit by reducing go between staff. 2. Tablet, Restaurant/food shop/ take away, Management: When very busy, which all business owners wish to be, this will give you instant information on what is happening in each sector of the business. It can even process sales and deliveries as well as sends orders through to the kitchen. There is a monthly rental rate and updates are free. 3. Automatic Biodiesel Converters: You pour in your used oils, vegetable or animal, and the automated BioPro processors will produce small batches of industrial grade diesel. This diesel can be used in your delivery vehicles, etc. This invention will save you money on fuel costs, waste removal and used oil removal. 4. 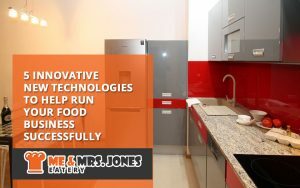 LED Alert Systems: Kitchens are normally very noisy places. This system alerts staff by lighting up when certain jobs are done or should be done. Any busy cooking area could benefit from this type of alert system. You cannot always hear, but a flashing light would draw attention. 5. Webcam Enabled Monitoring: This kind of system could be very helpful to owners of more than one business. You can now monitor all facilities simultaneously. 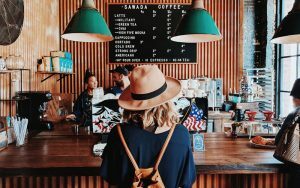 With all the new technological inventions, saving time and money, you can have more hours to think of new ways to boost your business and reach more possible hungry customers. Starting a business is not for the faint at heart. 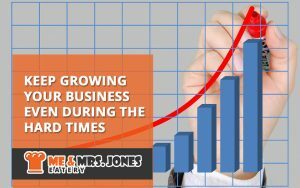 A new business can be very stressful and demands total focus and almost every minute of your time. You have to decide beforehand if you will be able to cope with all the demands on your time and all the chores that have to be done. It is very hard work. You have this brilliant idea, but will it be enough to make a successful business? 1. Start by doing Market Research on the need for your product or service. Who needs it? What age group will benefit the most? Where do you find your target group? Will this service or product enhance the life of people? You can circulate a questionnaire, online and by distributing pamphlets, to get an estimate on the demand for your product or service. 2. The business location is of great importance. You found your target market. Find a location where the business will be visible and accessible. But always keep in mind the cost. You are starting, and do not have a regular income or client base, as yet. 3. You need to establish a Budget plan. What kind of money do you need to start your business? Do you have this money available? If not, are you going to ask people to invest in your business? 4. Develop a business plan that state the business’ mission, the product or service, what kind of structures you will use regarding personnel, the target market and financial projections. If you need investors you will need this to persuade them to give you money. 5. Make a decision to be adaptable to input from your, probable, customers to optimise your business’ service delivery. You might have to modify certain ideas about your business or product to assure good customer service. Decide to learn as you go, and change your initial thoughts if better solutions are available. Also keep in mind that honesty is always the best policy. Renew your outlook, concerning the business, regularly. And always remember to be patient; Rome wasn’t built in one day.